November has come and the glittering Christmas lights have made a grand appearance and can be seen from my window overlooking the Vancouver skyline. I’ve been away from blogging for a few months engaged in many small adventures of daily life. It is time to return for we have entered the rainy season on our side of the world, which means that hearth and home, a good book, music and a cup of tea are welcome company after a brisk walk around the Vancouver Seawall. I am especially eager to share all of my ChasingART journeys. And what better place to start than with the Vancouver Biennalle, Open Air Museum, a non-profit charitable organization that exhibits great art in public spaces. Their motto: “Great Art where people live, work, play and transit” allows everyone to participate and be inspired to explore their personal creativity. Granville Island, which is situated in False Creek, was first known as a fishing area, before it turned industrial. Now, it is a tourist haven with over 250 businesses including a marvelous marketplace, Emily Carr University of Art & Design, Arts Club Theatre, trendy restaurants and a boutique hotel. Ocean Concrete remains as a reminder of the industrial legacy, but not as you would imagine. This company has a creative flair with its concrete trucks that look like strawberries and asparagus. Now, Ocean Concrete is the home of Giants. And they are magnificent! I agree they exclude joy and humour. I appreciate the creative spirit of these remarkable brothers! I love being transported to another part of the world and I love art. This post makes my heart sing. I like this blog a lot! I am delighted that you stopped by and am looking forward to our ongoing conversation. There is always an adventure waiting for us! You have a wonderful blog! These are so much fun!!! I sat and watched with my mouth agape – wow wow wow – all of those grain elevators along the mississippi river? what fun i would have had once uponce a time in the flatlands (delta) of my earlier years!! I was thinking of our grain elevators in Saskatchewan, which are no longer required and are being dismantled. They were beacons in a flat prairie. 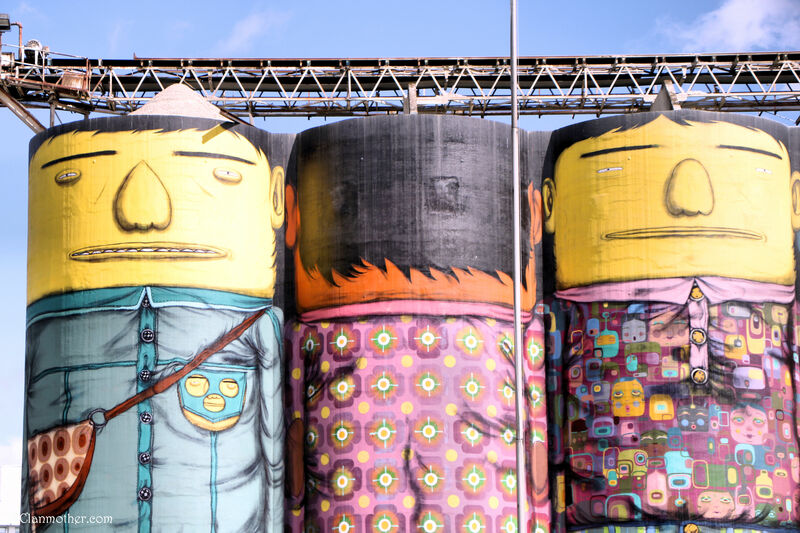 Did you link into video of the two brothers – OSGEMEOS (which means twins in Portuguese) They are from São Paulo Brazil. I love their outlook on creative endeavour. They exemplify “resilience.” Thank you for giving me that word for 2017!!! I knew you would! I can just imagine you looking up at their smiling faces. 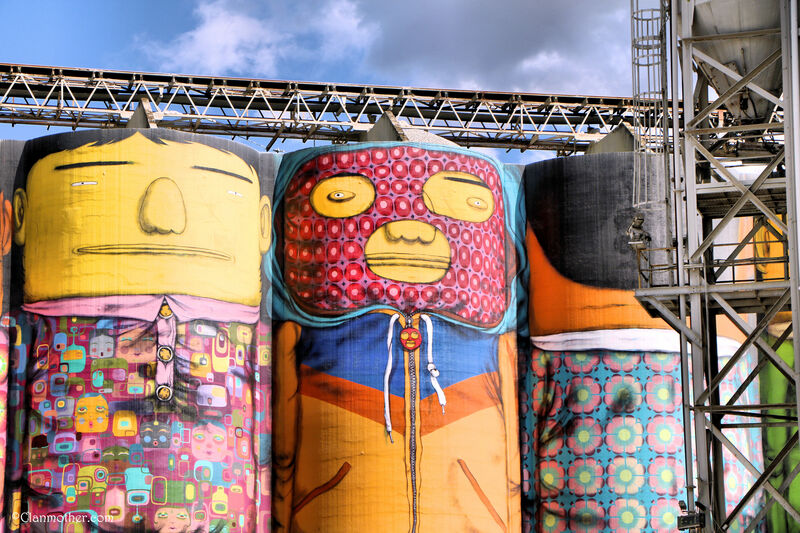 Check out the OSGEMEOS website. I love their philosophy. Art for everyone! Art for life! Art for community! Art for renewal. Many hugs coming your way! Very clever street art on those tanks. I see you’ve redecorated your blog spaces. Looking good! I am so glad you like my new template. It’s always fun to try something new and I like the way it showcased the artwork. I have become very interested in street art over the past few months, especially the transition from underground to main stream. It is art that wants to integrate into our lives, challenging us to participate, to engage, the live “big”. Banksy says it better than I could: “Art should comfort the disturbed and disturb the comfortable.” Heading over to your place – I see you have a new post!!! Hugs. Ich stimme voll und ganz zu. Ohne Kunst, Literatur, Musik und Tanz hätte unser Leben wenig Sinn. Wenn wir künstlerischen Ausdruck in anderen sehen, werden wir ermutigt, ihrem Beispiel zu folgen. Ich genieße unsere Diskussionen. I took another look at your photos of the terracotta warriors, truly a art collection that brings joy even now. You posted those photos some time ago. We are so fortunate to have the means to save–thanks to the new technologies. Enormously stunning. Extraordinary art for everyone! This, I believe, may be the next lasting and valued form of popular art. I am sure, beyond a shadow of a doubt that Monet, van Gogh and others of the great artists would be admirers. Thank you for sharing. What a clever place to display art. The clothing (especially the hoodie) makes me giggle! They are all painted! I am always amazed by the different personalities that are embedded in the individual giants. They look like they are having fun, are on some kind of adventure, and are asking for people to join them in the quest. They are a prime attraction at Granville Island. I have overheard some of the discussions of people who are transfixed by the enormity of the project. They are engaged!!! What I like most about public art: it democratizes art and challenges us to think differently, to try new things, to begin fresh conversations. Art is for everyone. Our communities are enriched by the presence of these displays. By the way, my next post will be about “Inspiring Impressionism” Daubigny, Monet, Van Gogh. Thank you for the suggestion to see this amazing exhibition. Hugs!!! I agree wholeheartedly, Liz. I believe that we have come a long way in how we embrace public art. I am grateful for those enlightened authorities who have guided the process. And for the many volunteers who work tirelessly to share their knowledge and experience. The video on your blog post today was an example – powerful stuff. The Daubigny event was on of the highlights of our trip. Truly remarkable.